With Lex Luthor free from custody, it is now clear that he's been planning his escape for sometime and he's been far from idle while imprisoned. This flashback episode shows how Lex has been influencing the lives of his sister and Supergirl over the past few years and what role Lex has to play regarding the mysterious Supergirl clone now controlled by the Russian government. Superman: The Movie (The trio of Lex, Ms. Teschmacher and Otis), Superman: Red Son and DC Bombhsells (concept of Kryptonians raised by Russians during Cold War) and the Superman comics leading into Death of Superman, where Lex Luthor introduced the Matrix Supergirl to Earth culture and trained her to work for him. How did Ms. Teschmacher justify taking off from work to fly to Kaznia multiple times? We still don't have an explanation for how Otis faked his death in 504. Jon Cryer is pitch-perfect playing Lex Luthor as a smooth manipulator. You almost believe his sob stories to win over the Kara clone, even as we know they're totally untrue. Melissa Benoist does an equally fantastic job playing the Kara clone and capturing her anger and confusion as she learns Lex has not been giving her the whole story. The opening sequence, in which Lex utilizes a drone which transforms into a Lexo Suit to lure Supergirl into a fight and reveal that he has powers now is well executed in terms of its visual effects. The sequence of Lex exiting the courtroom to Frank Sinatra's "My Way" is another example of brilliant staging and perfectly matching music to mood. The song becomes a connecting theme for Lex as the episode continues. The script for this episode is very intelligently written, even ignoring the literary and historical references. It explains a lot of what seems to be plot holes from earlier in the season (i.e. how the Kaznians just happened to have a room capable of protecting their clone from the Kryptonite seeding the atmosphere). In the opening sequence, Lex Luthor fights Supergirl on the roof of The Daily Planet. This is the newspaper for which Clark Kent famously worked in the original Superman comics. The fight ends with Lex bringing the globe on top of the Daily Planet building down on Supergirl. After being convicted, Lex Luthor is sent to Stryker's Island. In the Superman comics, Styker's Island Penitentiary is a maximum security prison in Metropolis, located in the West River. It has a special facility used to contain metahuman criminals and has been the home of Lex Luthor during his stints in prison. It is modeled on the real world Riker's Island prison, which is located in New York City in the East River. Lex makes reference to Eve Teschmacher being "a Manson girl," This is a nod to famous cult leader Charles Manson, who acquired a large number of groupies after being sent to prison. When the Warden of Stryker's visits Lex to inform he he has a phone call from Kaznia, Lex first asks him how his husband liked the court-side Knights tickets. The Warden says it made him "feel like Nicholson." This is a nod to actor Jack Nicholson, who had standing court-side tickets to watch the L.A. Lakers basketball team play for many years. What's curious about this is that, in the DC Comics Universe, Metropolis doesn't have a basketball team called the Metropolis Knights. Like New York City, Metropolis does have two baseball teams (The Monarchs and The Meteors) and two football teams (The Metros and The OTHER Metropolis Meteors). Their professional basketball team is the Metropolis Generals and their professional hockey team is the Metropolis Mammoths. Gotham City, it should be noted, has a professional sports franchise called the Gotham Knights. However, they are a baseball team rather than a basketball team. Lex made arrangements for the inmates at Stryker's Island to be fed lobster, endearing himself to his fellow prisoners. Lex dismisses the Warden when he thanks him for this, saying that lobster is "18th century peasant food, only fit for the indentured and the incarcerated." This was the general attitude regarding lobster until World War II, when it was repackaged as a delicacy for the rich after it became scarcer due to a lack of fishing vessels and the materials needed to catch it. Before that, lobster was the most common source of protein for the working poor in coastal cities in America. The Supergirl logo in the stinger for this episode has the name "Super Girl" written in Russian and shows the Red Son Superman logo rather than the usual House of El shield. One of the books Lex arranges for the Kara clone to read is Thus Spoke Zarathrustra by Friedrich Nietzsche. This was the book where Nietzsche proposed that the future belonged to a paragon of virtue he called a "superman" which would go on to inspire the name of a certain superhero. The Supergirl clone uses the alias Linda Lee while wearing a brunette wig to see America. In the classic Silver Age comics, Kara Zor-El used the same alias and disguise while she first came to earth and lived at the the Midvale Orphanage. One of the rich men in the club who harass Linda Lee wears a pin that identifies him as working for AmerTek, whom Lex identifies as an unscrupulous company. In the Superman comics, AmerTek was a corrupt military weapons manufacturer who employed John Henry Irons before he became the superhero Steel. The company has also appeared on Arrow and The Flash and was depicted as being equally corrupt. Lex has a drone he can control with his watch which can transform into a full Lexo-Suit of armor, capable of flight. Lex has a hologram of himself set up in his cell to hide his absence. When pondering things that might have caused the Kara clone's illness, Lex considers that the Black Kryptonite may have caused unchecked cell growth, which might be cancer-symptomatic. He also says it could be a telomere problem. He goes on to say they must stabilize the senescence, before Eve Teschmacher finally gets his attention. Judge: Mr. Luthor, you are charged with murder, ecoterrorism, and crimes against humanity. Since you have chosen to represent yourself, have you anything to say before I render the verdict of this court? Lex: (standing up) Superman made me do it. Lex: This is a paradigm shift. Aliens are among us. And for the rest of human history, there will only ever be "before Superman" and "after." I am protecting mankind from an extinction event. And if this pearl-clutching jury of my... (voices trails off, hesitating, finally saying the word) peers... wants to put me behind bars for it, they are welcome to try. But know this. I will always have my thumb on the scales. Judge: Alexander Joseph Luthor, (clears throat) You've been found guilty on all counts and will serve 31 consecutive (coughs a bit more harshly) life sentences. Lex: Maybe we should make it 32? Eve: Wow. (chuckles) Nice prison you got here. Lex: It's for conjugal visits. But still, after this, it's back to concrete and iron. Lex: Stryker's is a Petri dish. Bottle city. I've even managed to teach some of the inmates chess. I like mentoring. Eve: It's a waste. You're a once-in-a-generation mind and the only man standing between us and total annihilation. You know, I used to write you letters. Lex: I read them. You're literate for a Manson girl. Eve: You are not Manson. And for the record, I'm not just some girl. I've got degrees from Yale in literature and physics, and I am a former Junior Miss North Carolina. Lex: Ms. Tessmacher, I need you to do me a favor. What do you know about CatCo Magazine? Lex: Jimmy Olsen works there. He's been a thorn. But he's connected to the second Kryptonian. And I happen to know that Cat Grant needs a new assistant. A woman of your talents would have no problem finding a job there. Eve: Consider it done. But you do know there's a lot more that I can do. Lex: And you will. We're gonna make you undeniable. Lex: Pennies from heaven, how does this happen?! Clone? Eve: I think I know. It's called Harun-El. Black Kryptonite. It splits Kryptonians in two. Supergirl must have come into contact with it. Lex: She's a blank slate. Doesn't share Supergirl's memories. Eve: We don't know exactly how this works, yet. Eve: (calmly) It's Lena. And she has more. Eve: (smug) I told you I'd be more useful at L-Corp than CatCo. Lex: And how is my darling sister? Eve: Obsessed. About to have a breakthrough with the Harun-El. But she hasn't produced results yet. Lex: See that she does. Otis: So do I stay and hang with the Commies? Lex: What? No, you're driving! Otis: So what's the play? Lex: (sighing) Chinese idiom. Paper tigers threaten, but are destroyed easily. Kaznia wants to move on the US. They're crazier than Russia. They wanna bring back the glory days of the Soviet Union. Eve: So you wanna help them? Lex: I don't care about their politics. Regimes change. Kings die. But if Kaznia attacks America, and I foil the attack, America will hail me as a hero. To do that, I'm gonna need patsies in both the East and the West. So, Otis, fetch your sister and find me a real American. Someone charismatic, a radical. Otis: (grinning) I think I know just the guy, Mr. Luthor. Otis: Name's Ben Lockwood, seems smart. Lex: I'm glad someone does. Otis: Wait. Where are you going? Lex: Back to Stryker's. Prison's the best alibi the world has yet devised. And I'm about to need a lot of alibis. Lex: You've read that one more than the others. Gatsby. Why? Kara Clone: (enthusiastic, but struggling to find the words in English) It's beautiful. Lush. I, uh... I think that's the word. The language. It's hard to even imagine the world that way. Lex: (harshly) I didn't give it to you because it's pretty. This is a book about vapid, profligate fools. Money is always acquired at someone else's expense. Kara Clone: (confused) But you have money? You must. The way you come and go. Lex: I do. Because it is their weapon. The way their world works. Read it again. Lex: What? Oh, right. The Harun-El. It made her. It might stabilize her. Bring it to me. Eve: It's not ready yet. Lena's trial still has a 100 percent mortality rate. Lex: Then I'll solve it. Eve: The girl is dying! Lex: What do you suggest I do?! She is everything I have worked for! She's a... a miracle. The skies opened up and gave her to me. I...I can't lose her. Lex: You're right! I have to give myself cancer. Eve: Whoa, whoa, whoa. That is not what I was gonna say! Lex: No, you were going to tell me that I need to work with Lena. And you're right. Except she won't buy it. She'll never work with me. But she will... save me. Lena: I'm not like you. I wanna help people. Lex: I'm people! And you're using the black rock to make super soldiers. Who is that helping? Kara Clone: Supergirl acts on her emotions. It's selfish, ugly. I will not be her. I will be me. I will be disciplined. I will follow you and destroy her. Lex: Do you remember that story about Alexander the Great and his father? Lex: You thought I was Alexander. But I'm Philip. I only get one lifetime. But you're forever. My gift to the world, my legacy. Lex: (In Russian) My Red Daughter. Lex has developed super-strength and enhanced durability thanks to the Harun-El cure. Lex went on trial for 31 counts of Murder, Eco-terrorism and Crimes Against Humanity in the spring of 2016. This would have coincided with the time in between the end of Supergirl Season One and the start of Supergirl Season Two. Both James Olsen and Lena Luthor testified at Lex Luthor's trial. Lena was wearing a wire during the flashback sequence in 415 where Lex turned the sun red. Lex was convicted of all charges. He presumably faced further chargers for Murder and/or Attempted Murder after he somehow managed to poison the judge, jury and prosecutors at his trial within seconds of being convicted. Eve Teschmacher was a fan of Lex Luthor's work who went to the trial hoping to see him. As Lex was taken away after being convicted, she was approached by Otis Graves. Ms. Teschmacher later visits Lex in prison, where he recruits her to apply for the job as Cat Grant's personal assistant so that she can spy on James Olsen and Supergirl for him. This is where we first saw Eve on the show, having just started the job in 201. Eve Teschmacher attended Yale and earned degress in Literature and Physics. This reaffirms her statement in 321 that she studied Nuclear Physics at Yale. Eve Teschmacher was also Junior Miss North Carolina. Lex carves a relief of Hannibal crossing the Alps into his cell wall over the course of two and a half years. The Warden of Stryker's Island has a husband who is a basketball fan. Lex arranged for him to get court-side seats for a team called the Knights. Lex also made arrangements for the inmates of Stryker's Island to be fed lobster. Lex is contacted by the Minister of Defense for the nation of Kaznina. This takes place "six months ago", sometime in the Fall of 2018, before the events of 401. Lex Luthor can speak Russian. Lex knows the home address of the mother of Stryker Island's warden, the church she plays Bingo at every Friday night and the name of her most heated rival. Showing this convinces the warden to look the other way when Lex leaves prison for 72 hours to travel to Kaznia. Lex is shown to be playing four games of chess simultaneously with other inmates. He is able to Checkmate all of them at the same time. "Nine months ago", shortly after the events of 323, the Kaznian military discovered the clone of Supergirl made by the Harun-El. They recognized her immediately and confirmed that the real Supergirl was in America. The only word the Supergirl clone would say at first was Alex. She didn't seem to have any verbal language skills but did react violently to a soldier who tried to touch her. The Supergirl clone was personally taught the Russian language and geography by the Kaznian Minister of Defense. This process took up about three months. It is shown here that while her verbal skills are limited she knows how to read English well enough to look words up in a Russian/English dictionary. The first time the Supergirl clone is taken outside and trained in the use of her powers, she is startled by a sudden gunshot and activates her X-Ray and Heat vision, killing several soldiers before she is swarmed and tasered into submission. This prompts the Minister of Defense to contact Lex Luthor. While Lex is en route to Kaznia, the Supergirl clone hears a boy calling for help. She flies to his aid and discovers his home being robbed by three men. She kills the three men. When Lex arrives, he finds the clone hugging the boy, clearly shaken by what she has done. When Lex first speaks to the Supergirl clone, he says that he is Lex. She asks if he is Alex and he agrees. Lex is accompanied by Otis Graves and Eve Teschmacher. Lex agrees to teach the clone how to use her powers and train her to hate who the Kaznians want her to hate for an undisclosed sum of money. Otis notes that Lex isn't as liquid as he used to be. The soldier who tried to touch the Kara clone before is shot after Lex instructs him to be removed. When the Minister of Defense says he can have the soldier re-stationed in the base where the clone, Lex points out that the clone can see through walls. When the soldiers is shot, Eve Teschacmacher flinches and Lex tells her not to do that in the future. The clone says that the name "Alex" is all she remembers apart from how to speak some English and read it somewhat better. Lex lies and says that he and the clone are good friends. She does not know anything about Krypton or why she has her powers. Lex says that he will tell Kara everything but first he must go for a time. He gives her a package of Chocos and tells her that he will send books for her to study and that he expects her to be speaking English better when he returns. Eve Teschmacher is the one who figures out that the Supergirl clone must have been created when Supergirl came into contact with Harun-El in 323. She tells Lex about how Harun-El is a black Kryptonite that has the ability to split Kryptonians in two but that Lena thinks it might have other properties and us experimenting with it in secret. Eve Teschmacher smugly says that she told Lex she'd be more valuable to him as a spy on Lena Luthor at L-Corp than watching Jimmy Olsen at CatCo. Eve started working for Lena after the events of 321. Lex's ultimate plan is to help the Kaznian's turn the Supergirl clone into the weapon they want but then set it up so he can stop that weapon, causing the public to see that he was right all along about the dangers posed by the Kryptonians and other aliens and hail him as a hero. Otis suggests that Ben Lockwood might fit the role of a patriotic patsy who can be manipulated to serve Lex's agenda in the United States, showing Lex one of Lockwood's pamphlets We saw Otis pick up this pamphlet in a flashback in 403, which took place during the events of 323. This confirms that Lex was the mastermind behind setting up the Children of Liberty, who sent Otis and Mercy Graves to Ben Lockwood in the flashback sequences of 403. The books that Lex sends the Supergirl clone include The Great Gatsby by F. Scott Fitzgerald, Thus Spoke Zarathrustra by Friedrich Nietzsche, Course in General Linguistics by Ferdinand De Saussure, Edward Gibson's The Decline and Fall of the Roman Empire, Their Eyes Were Watching God by Zora Neale Hurston and Contribution to the Critique of Political Economy by Karl Marx. Lex learned both chess and the Russian language from the chess-master Anatoly Karpov as a boy. Lex quizzes the clone on Philip of Macedon - the father of Alexander The Great, who accomplished far more than his father ever had and conquered the world. The clone guesses correctly that Lex was named for Alexander the Great and admired him. The Great Gatsby is the clone's favorite book. She likes the rich language and descriptions of the beauty of the 1920s. Lex says that is not why he gave it to her. He wanted to show her how wasteful and greedy the idle rich were. She says that Lex must be rich and he agrees, but claims he only uses his money as means to an end to counter corrupt elites and those who abuse their power. The Kara Clone begins visiting the boy she saved for tea on a regular basis. His name is Mikhail. Mikhail's mother is away working much of the time. Mikhail's father was a bad man who abandoned them. Lex visits Mikhail with the Kara Clone on one of these visits. He says that he had a bad father too, but his father stayed. It is during this visit that the Children of Liberty plot to seed the sky with Kryptonite from 402 is set into motion. Lex was prepared, however, and built a chamber that would protect the Kara clone. It is here that he reveals that she is an alien from Krypton, explains how Kryptonite can harm her and that there is another Kryptonian, Supergirl, who believes in the greed of the nations that oppose Kaznia. When the Kara clone is released from her safety chamber in 404, Lex agrees to show her America and tell her more about Supergirl. Lex refers to Supergirl as the clone's sister. The Kara Clone draws a parellel between herself and Supergirl and Lex and Lena, identifying her as the usurper who took what was owed to another who just wanted to help people. Lex arranges for the Kara Clone to work in a ritzy club under the name Linda Lee. This allows her to see first-hand the piggish behavior of American captains of industry. Lex Luthor is aware of Supergirl's secret identity and breaks into Kara Danvers' apartment so the Kara Clone can see the "opulent" lifestyle of her sister. While looking at Kara's kitchen and being stunned at how much food is saved for one person, the clone sees a photo of Alex Danvers with Kara and sees the name Alex on a score-card from game night pinned to the fridge. The Kara clone is forced to impersonate Kara when Alex shows up at her apartment to water her plants. This reveals that this scene took place while Kara was on vacation in Smallville, during the events of Elseworlds. After learning that Supergirl has an Alex of her own, the clone reads Kara's journal instead of immediately returning to Kaznia. Through it, she learns of Kara's life and how she befriended Lena Luthor. The Kara Clone goes to L-Corp to see Lena and impersonates Kara to talk to her. She runs into Eve Teschmacher, whom she tells that from what she has seen America is unsavory but it is not as bad as Lex told her. She also says that Supergirl seems to want to help people and has compassion and friends like Lena. She wants to know how Supergirl and Lena could be friends, based on what Lex told her of his treacherous sister. Eve Teschmacher reports this to Lex in prison, who comes up with a plan to win back control of the Kara clone by killing Mikhail with a missile attack. Eve Teschmacher sneaks onto the USS Yosemite - a US Navy ship on maneuvers near Kaznia - and launches a missile which destroys Mikhal's home after Otis sets up a receiver to attract it. The Kara clone goes on a rampage and nearly destroys the USS Yosemite. Lex stops the Kara Clone, but admonishes her for being undisciplined and weak. Otis is revealed to have saved Mikhails' life. He tells him that he was dead once but instructs Mikhail to play dead if he ever sees a bald man. We see the clip of the Kara Clone training from 411 where she developed the nose-bleed and passed out. Lex is contacted after this happened and informed that the clone is dying of an unknown illness. Lex concludes the only thing that can save the clone is the Harun-El, which means he needs to help Lena finish her work. Since there is no way Lena will work with him, he concludes he must goad her into saving him. This leads Lex to go into the radioactive chamber he built to test Kara's invulnerability, and exposing himself to enough radiation to give himself cancer. Lex tells Lena about his illness, confirming what Lena said in 415 about Lex telling her he was dying of cancer six weeks earlier. Lionel Luthor was an alcoholic. Lex uses a blood transfusion of his own blood to cure to treat the Kara clone. He apologizes for what he said before. She in turn apologizes for losing control of her emotions. She declares that she will be more logical in the future and follow Lex's lead, not letting her heart guide her as Supergirl does. Lex gives the clone a title - Red Daughter - and declares that she will be his legacy - the new Alexander who will conquer the world and create a new era of peace. Supergirl tells Alex and James that Lex Luthor has escaped. Alex says she will find Lena. She tells Supergirl to find J'onn and then go look for Lex. Ms. Teschmacher is seen dropping Lena off at her office and leaving a letter behind on her desk. The Red Daughter is seen hovering over an American city as the episode closes. A powerful episode that redefines the series and the stakes of the season. While the Red Daughter storyline has been handled clumsily before now, this episode explains away the missteps and inspires a surprising degree of sympathy for its villains. The Red Daughter is shown to have been manipulated from the first moment of her creation. 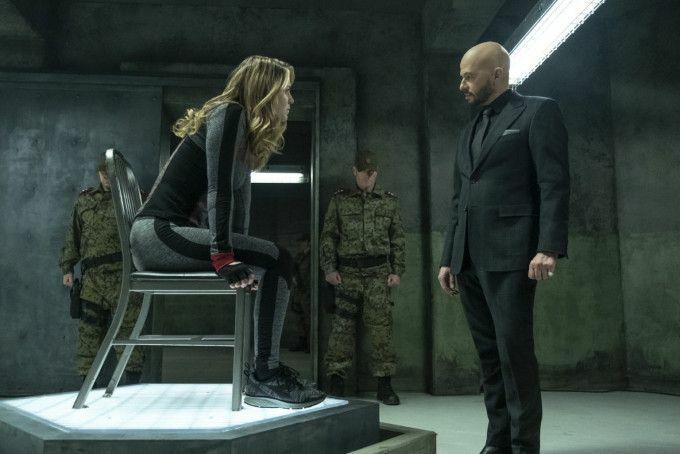 Eve Teschmacher is shown to have been manipulated by Lex Luthor, even if she is more ruthless than we thought. Even Otis is shown to have a softer side. And you almost feel sympathy for Jon Cryer's Lex in those moments where it seems like he's slipping a little truth into his sob stories, such as when he mentions his own bad father and looks uncomfortable at the honest emotion. Almost.